Bournemouth Borough Council: Pure Town Planning have recently secured planning permission for the change of use to the annex building of the popular Yenton Hotel located in Gervis Road on the East Cliff of Bournemouth. The existing annex building currently houses hotel bedrooms, hotel owner’s accommodation and a self-contained ground floor flat. The proposed change of use sees the conversion of the annex building to a ground floor office (B1 use) and two large self-contained holiday apartment catering for 12 bedspaces in total. The introduction of a ground floor B1 office use is characteristic of numerous other properties along Gervis Road which has seen a number of conversions to office use over recent years. Similarly to the tourism potential, the site is also well positioned for future office use in terms of proximity to bus routes, the travel interchange and the A338. Importantly for this change of use application, the potential loss of tourist accommodation was a key concern. Considerable efforts were made throughout the application process to ensure against such a loss in tourist bedspaces. 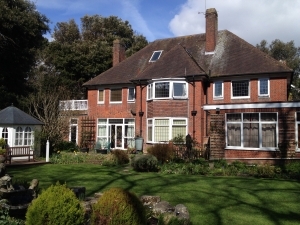 As the annex building is located within the East Cliff Conservation Area, great care has been taken to put forth a proposal which will not have any detrimental impact on the current arrangement on site in terms of significant external alterations to the existing building. As such, the approved change of use of the annex manages to retain its traditional appearance whilst also respecting the character of both Gervis Road and the wider East Cliff Conservation Area. The approved change of use will breathe new life into this annex building, through a vibrant new office space in a highly desirable and sustainable location, as well as reinvigorating the tourist accommodation potential on site through revamped holiday apartments on the East Cliff which caters fot the ever changing needs of today’s tourist market. If you are wondering whether you are missing an opportunity to convert or redevelop an existing hotel property, then we would be happy to advise you. We offer a confidential FREE half hour consultation so to discuss the potential development of your property, please call us on 01202 585524 or email info@puretownplanning.co.uk to find out how we may be able to help.